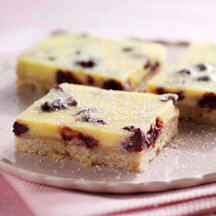 Two all-time favorite desserts, cheesecake and lemon bars, come together to create one fabulous bar studded with blueberry juice-infused dried cranberries. For Crust: Combine flour, oats and powdered sugar in large bowl. Using electric mixer, beat at low speed. Add butter; increase speed to medium-low. Beat until crumbly and mixture starts to stick together. Pat into bottom of 13x9x2-inch baking pan. Bake for 20 to 25 minutes or until starting to brown. For Fillng: Meanwhile, combine sweetened dried cranberries and blueberry juice cocktail in 1-quart saucepan. Cook over medium-low heat, stirring occasionally, until juice is absorbed and cranberries are soft. Set aside to cool. Combine cream cheese and granulated sugar in large bowl. Beat at medium speed until smooth and creamy. Add lemon zest and lemon juice; beat, scraping side of bowl if needed, until smooth. Add eggs and flour; beat until smooth. Drop cranberry filling by small spoonfuls over baked crust; spread out. (Will not completely cover crust.) Pour lemon filling evenly over cranberry filling. Bake for 20 to 25 minutes or until set in center. Cool completely. Store covered in refrigerator. Sift 2 tablespoons powdered sugar over filling before serving. Run knife around edges of pan to loosen bars before cutting.